Originating from the Ashanti people of Ghana the Ananse stories are part of the African oral culture of story telling. This story is based mostly on a version called ‘The Parade,’ which is about how Ananse the spider tricks a local chief into letting him marry his daughter. He does this by completing the chief’s impossible task of making all the animals in the jungle parade past his house. It also references another story where Ananse traps a swarm of hornets inside a calabash to buy his stories from the Sky God Nyame. As the painting has a narrative based on more than one tale it responds to the dynamic, organic storytelling of the oral tradition. Ananse the spider represents the trickster spirit of rebellion and is often seen as a symbol of slave resistance and survival. He shares many similarities to Br’er Rabbit, found in the African American Uncle Remus folktales; both are examples of how to behave and overturn the social order if you are in a position of weakness. 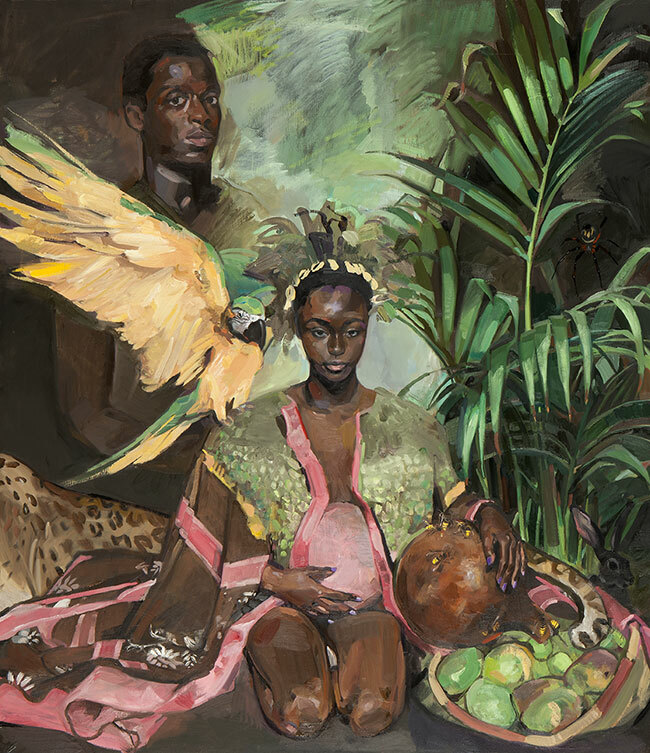 As the Ashanti are one of Africa’s matrilineal societies the painting’s composition revolves around the female character and suggests more of an active role than she has in the stories. Pregnant and seated amongst ripe fruit and animals, her positioning emphasises fertility and strength. She is holding the calabash of hornets and also harbouring a rabbit, who is the spider’s rival, which indicates that she is also involved with manipulating the stories, her father and the spider. Based on stories of Ananse the Trickster spider - see below image for text.